In this chic necklace, Peten Artistic Jewelry artisans of Guatemala create a modern geometric design. 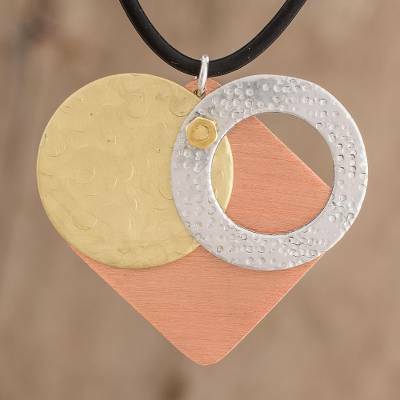 The pendant features a square of copper topped with a circle of aluminum and a circle of brass, with each metal sheet having a different textured finish. When the circular pieces are rotated upward, they form a heart. The pendant hangs from a black nylon cord. You can find brass and copper pendant necklace 'Parts of a Heart' by Peten Artistic Jewelry in jewelry categories such as Geometric Necklaces, Heart Shaped Necklaces, No Stone Necklaces, Aluminum Necklaces, Nylon Necklaces, Brass Necklaces, Copper Necklaces and Pendant Necklaces. Enjoy exploring these sections for other Novica treasures. "This project has transformed my life and the lives of the artisans… It's so satisfying to know that with a single idea, we can change many lives." In 2001, Pat Pannell began visiting Petén where she met a lovely family whom she began helping financially. But her love for others led her to something even bigger. In 2010, Pat and her sister, Jeanne Sheridan, wanted to do more to help. They wanted to impact the local community by creating jobs that would bring in a constant and dignified income. They decided to set up a jewelry project with innovating designs that could be sold outside Guatemala. "One small family was our starting point," the women say. "Since then, we've had a great success working with artisans who trust us and whom we trust completely for their creative skills in crafting jewelry." Today, a small group of artisans have learned to develop excellent jewelry with a unique touch. The money this brings in has made a big difference in the quantity and quality of the food they can serve their families and the education their children receive. "This project has transformed my life and the lives of the artisans, who have had to learn how to administer the workshop. I travel there very often to be able to promote their jewelry. It's so satisfying to know that with a single idea, we can change many lives and, from this, continue with many others. We can create in them a new illusion and their dreams and goals continue to grow. What's more, they can achieve them!" Pat says. The Peten Artistic Jewelry artisans use traditional techniques with the objective of creating modern designs without abandoning the essence of these methods. "We strive for innovation and quality. Our jewelry is crafted with love and dedication, and we hope you like our work."